For fifteen long years, a war has been raging between the human kingdoms and the demon realm. Seeking an end to the conflict, the human Hero infiltrates the Demon King’s castle to force a final confrontation. Unexpectedly, the Demon King turns out to be a woman, and more surprisingly, she asks for the Hero’s aid in changing the course of the world. Ending the war at once will cause the fragile human alliance to collapse, but she and the Hero have a chance to save millions through education, trade, and a bit of deception. Maoyu was recommended to me by Scott, so Brendan and I watched it together. This show is short, very dense, and introduces a lot of concepts very quickly, meaning that it can feel somewhat overwhelming at first. However, it dodges and plays around with a lot of common fantasy tropes for some unexpected twists on a fairly well-trod formula. It’s certainly unlike most other fantasy shows you’ll see out there these days, and that alone is enough for me to recommend it. One thing to note about the show is that all of the characters are referred to by their jobs or titles. Hence the primary human protagonist is called Hero, while the queen of the demons is called Demon King. Other names like Knight, Mage, Winter King and so on round out the cast list, and place names like the Winter Pass village and the Central Kingdoms are common. Once I got used to this, it actually helped me keep track of the fairly large cast. Combined with a map that is often shown during scene changes, it made following the different locations much easier. Many anime lack a solid sense of scale or geography (Utawarerumono and almost all space/scifi shows come to mind), but this one gives a solid understanding of its world, which I greatly appreciated. 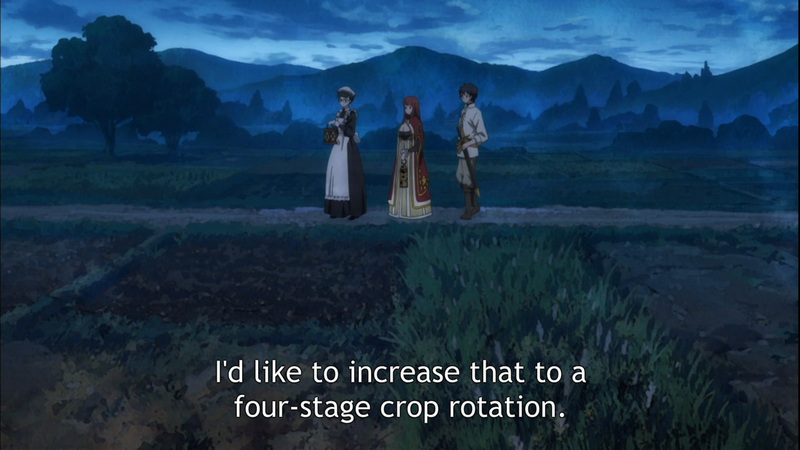 The story of Maoyu is remarkably grounded for a show set in a relatively “average” fantasy world. The Demon King, realizing that ending such a long war could have disastrous effects on both the human and demon nations, convinces the Hero to join her and look for other solutions. She takes on the guise of an academic (in keeping with the naming convention, anyone not in the know refers to her as the Crimson Scholar), and uses her knowledge and the Hero’s power to introduce new forms of farming, better crops and other advances to help stabilize and enrich the human world while working surreptitiously towards peace. It’s refreshing to see the protagonists seriously working on resolving a conflict rather than just ending it. 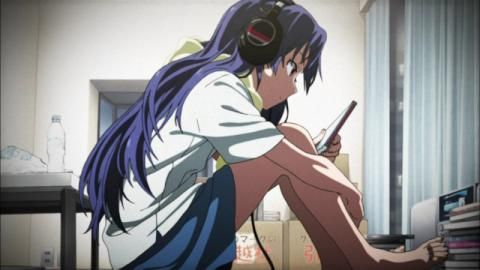 This focus on exerting “soft power” and avoiding unnecessary conflict is a central theme of the show, with the chief protagonists and several other characters working hard to slowly reduce hostilities. As the Scholar, the Demon King focuses on educating the populace and promoting social change, while the Hero acts in the background through discreet displays of force and the use of his magic abilities. They acknowledge that their path is not perfect, and many may suffer despite their efforts, which helps drive home the point that they are taking the long view. The show plays this out well, taking place over the course of a fairly long stretch of time. There are a few downsides to this style of storytelling, however. Since this is the not-middle-ages and we’re dealing with things like crop rotation and feudal economics, time-skips of up to six months happen frequently and often without warning. This makes some parts of show feel jarring and disconnected. It keeps the story from dragging, but there’s so much happening between the protagonists’ efforts and the feuding between humans and demons that the 12-episode length is a major constraint on the series. This is compounded by the fact that the show alludes to other places and characters that do not have any impact on the story, sometimes coming completely out of left field and never being picked up again. I would attribute this to the anime being based on a series of light novels, where concepts may be introduced in one book but not explained until much later. Yet again, the limitations of having only 12 episodes to work with become painfully apparent here, and we learn relatively little about the demon world, though the human kingdoms are given a decent amount of character. 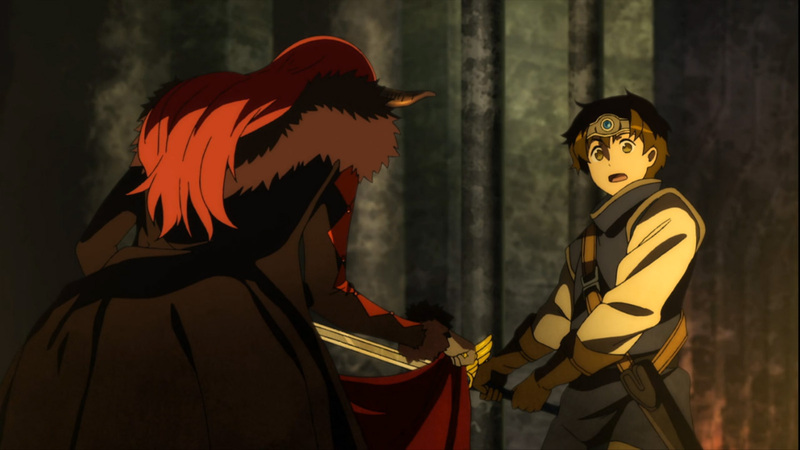 Despite some flaws in pacing, Maoyu does do a good job with its setting and world-building. The setting is nothing particularly new in itself; typical pseudo-European medieval lands on one side and the somewhat more colorful demon realms on the other. With that in mind, the show does very interesting things that help set it apart from the run-of-the-mill. It doesn’t rely heavily on magic to explain things away, but the impact of magic is often sudden and dramatic, which I like. Even better, people in this world behave like reasonable individuals, and rarely make stupid decisions just to further the plot. Something I really appreciated was the costuming. So many shows go out of their way to create “unique” looks for their characters that just feel ridiculous or poorly thought-out. The outfits most people in Maoyu wear are actually reasonably close to historical European fashions, with slashed sleeves, bright colors and period-appropriate hairstyles dominating. There are still some silly outliers, like the Hero’s tiny breastplate and the Head Maid’s decidedly 19th-century getup, but these are the exception. As I mentioned earlier, the cast of Maoyu acts intelligently, and characters go through distinct arcs that help round them out over time. The Demon King is defined by her knowledge and calculating nature, while the Hero is physically and magically powerful but socially restrained. Other characters, especially the Demon King’s servants, get a lot of time to shine and develop in their own right. On the downside, the large time-skips and the amount of time the Demon King and the Hero spend apart mean that we don’t get to see their relationship really develop as much as it could over the year or more that the story is supposed to follow. It’s not a deal-breaker, but it left me feeling like the main characters didn’t evolve nearly as much as the supporting cast. As a side-note, it feels odd that the Demon King is responsible for almost all of the major advances that help bring the human realms greater prosperity. It’s clear that she is extremely intelligent and has been studying the problems she faces for a long time. It still sells the human side of the cast a little short when every single new invention or technique is handed down to them by the all-knowing Scholar. Having the human kingdoms improve or modify the Demon King’s work to better suit their needs would have given them more agency. To be fair, the Merchant’s Alliance does show a lot of initiative and demonstrates humanity’s drive, but more often than not, it’s still dancing to her tune. The biggest flaw in Maoyu is its occasional dips into romantic comedy, which feel at odds with its more serious, grand-scale tone. The Demon King and the Hero are sort-of, kind-of married, but both are inexperienced with relationships. This makes their personal scenes together look like the fumbling of two high school students rather than the interactions of world-changing masterminds, though it does provide a change of pace that can be welcome at times. However, the romantic rivalry between the Demon King and the Knight feels forced and falls too far on the silly side of the fence compared to the rest of the show. Probably the most glaring moments of dissonance come from early interactions between the Head Maid and the Demon King. The Maid denigrates the Demon King’s appearance, then turns around and tells her to basically “show off the goods”, focusing just a bit too long on the latter’s chest. Magnificent though it may be, the show’s peculiar focus on her bosom can get irritating as it dumps serious socio-economic themes for cheap fanservice. I’m not surprised that the Maid is particularly candid with her mistress, but it feels awkward and unnecessary. Last but not least, I have to address the final episode. While it does do a decent job of wrapping up the issues that were raised throughout the series, it also spends a lot of time introducing new problems in surprising detail. It’s not quite a cliffhanger, but it casts a long shadow over everything the protagonists have accomplished, and left me feeling less satisfied with the conclusion. The lack of time and the limitations of the source material are the primary reasons for this, but I feel that the writers could have closed things more effectively while still keeping the door open for more trials down the road. 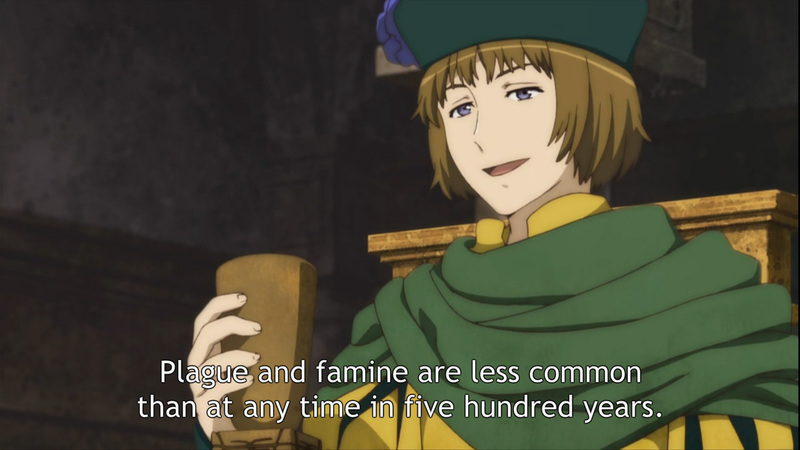 Maoyu is a very interesting show that does a lot of things right, but is sorely limited by its length. Some quirks in storytelling and character also cheapen the overall experience a little, but nothing prevented me from enjoying it. If you want to see the workings of medieval economics and social change unfolding and conflicting with tradition, religion, and geopolitics, you’re in for a real treat. If that doesn’t interest you, there are still nice bits of action, intrigue and real character development. The unusual premise and complex plot are enough to make up for some poor pacing and a few wonky changes of tone. I’d have to agree with your review. 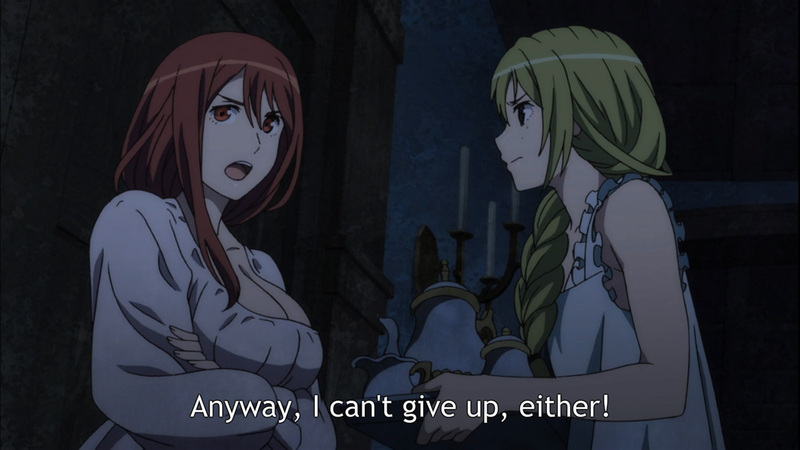 Maoyu was incredibly well grounded despite being set in a fantasy world. 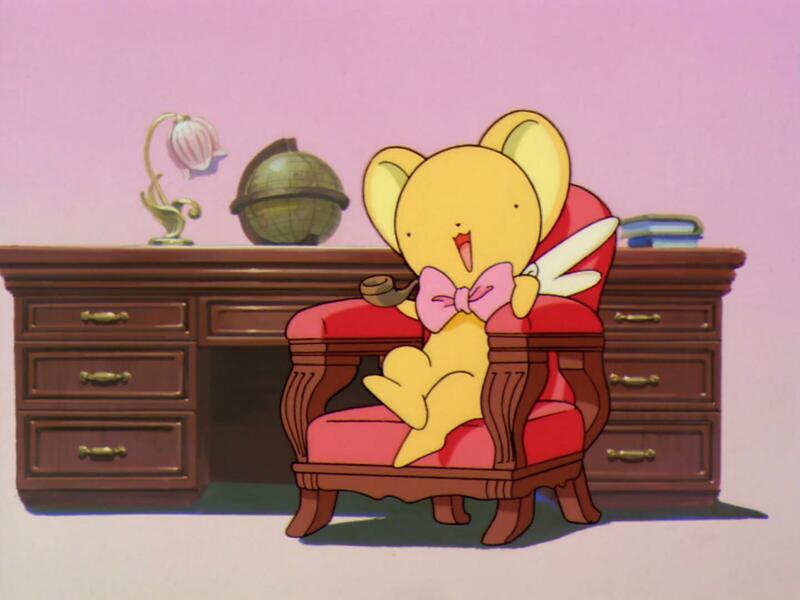 The world building was well implemented, the cast was well introduced. The series simply suffered from a lack of time and pacing. Great review! Thanks! I was really impressed with the setting, and the characters were much more interesting than I initially expected. I definitely wish there had been more time to let the story take a more leisurely pace, but it’s still a fun show overall.